All reviews are the subjective opinions of third parties and not of the website or its owners. Reviews are placed by members of the public that have held a function or event at Firs & Bromford Sports & Community Centre. 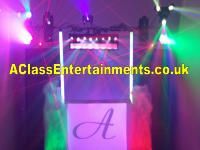 At needadisco.com we only accept reviews from confirmed clients that have booked a DJ to play at Firs & Bromford Sports & Community Centre via our website, with the arrangements independently verified by both the DJ and the client before the event takes place - no "fake reviews" here! "we were quoted a price when inquired about the venue^ which included 4hrs setting up the day before^ and an hour before the event for dj and food to be brought in and set up^ also an hour after to clean up. On day of event^ the guy would not open up at 3 as promised and sat outside in car and we were informed he wanted more money^ as hed made a mistake. He never opened untill about 3-25 and told us that we had to be out for 7pm^ with no time to tidy up. He told us cleaning up time was included in our room rental^ and well have to finish early. I believe it was to obtain more money from us^ and felt held to ransom^ as we had dj waiting to set up^ and face painters arriving..... would not use again and would not recommend at all." Helpful information for DJs and entertainers visiting Firs & Bromford Sports & Community Centre provided by trusted members of needadisco.com. Information is based on enquiries and bookings handled via needadisco.com so whilst it's a great insight, if you have any questions or concerns about holding a function or event at Firs & Bromford Sports & Community Centre please contact the venue. Firs & Bromford Sports & Community Centre has previously been hired as a venue for private parties such as birthday celebrations, anniversaries, engagements etc. Firs & Bromford Sports & Community Centre has previously been hired as a venue for functions and events such as sports club social evenings, masonic events etc. Firs & Bromford Sports & Community Centre is in our Community Halls & Spaces category. The map below shows other local venues in the same category.